Sometimes marks and scruffs on interior walls can diminish the look of a well-designed room. Depending upon how much time has passed since the walls were last painted, sometimes you can hide unsightly blemishes by covering them with touch-up paint that matches the existing wall color. Even if you don't know what the original color is, there are other ways that you can accurately match your current wall color. The best way to match the paint from an existing wall is to bring the original can of paint to any reputable paint store. Usually most paint stores can easily re-create the hue if paint label is still visible with the formula. In some cases, the store can still match the paint and create a new paint formula by utilizing a computer matching system. This type of system can analyze the color and create the match that usually turns out to be very close to the original. Many chain paint stores also maintain records of other paint manufacturers, and they should be able to determine the color. Always make sure that the match is correct by applying paint to a sample. Sometimes finding the original can of paint from a specific wall color can be impossible. If that’s the case, your local paint store can create a paint match if you are able to bring them a color sample from the wall itself.. By using a putty knife, simply cut a two-inch square in the drywall from a less noticeable area, such as a closet, above a framed door, or inside an electrical outlet. 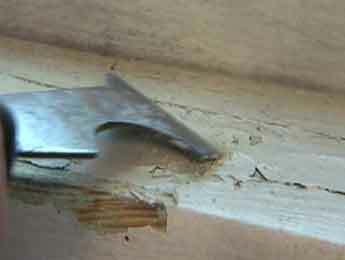 Gently press the knife blade into the drywall without damaging it in order to remove the top layer of paint. Most chain paint stores have a computerized paint-matching system that has a spectrophotometer that can create a new formula based from the scan. A sample paint card from the original paint manufacturer with the paint formula printed on it, is even better! If that particular color name and color formula is still in existence then the match process should take only minutes. On the other hand, if a sample paint card was not kept on file for 10 years, don’t fret, simply travel to your local paint store and ask them for a paint fan deck. These fan decks contain all of the colors that they make. Many homes in Reston Virginia are part of a Homeowners Association, and it is the Association that dictates what colors are to be applied to the exterior of those homes that are within the community. Needless to say, you may have trouble finding an exact paint match for an existing wall that is moderately faded due to age. A lot of times simply cleaning the walls with a mild dish detergent and warm water to remove dirt will reveal the true paint hue. Something else to consider is how the previous paint was applied. If it was sprayed, touching-up that wall will make matters worse. In those cases, it would be necessary to brush and roll complete walls. After touching-up a wall section, allow it to dry completely before deciding to try a different touch-up color. Davinci's Painters are experts at matching colors for touch-up purposes, so give us a call! 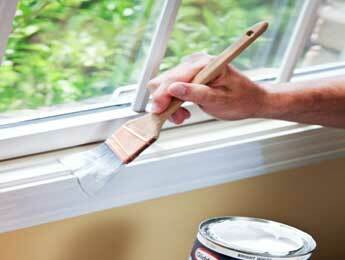 Are you planning on re-painting the interior of your home but concerned about the toxins released through paint fumes? Before beginning the process of painting the interior of your home and choosing paint, an important aspect to consider is the amount of Volatile Organic Compounds that are contained within the paint material. VOC’s are known carcinogens. Some VOC paints can also contain chemicals that have been linked to cancer. In addition, these hazardous chemicals that are released into the air of your home can put you or someone in your family at a greater risk of developing asthma or allergies. Some studies have shown that the presence of these pollutants can be extremely concentrated following the application of interior paints. In fact, elevated VOC levels can persist long after the paint has dried in the room. Although lacquer and oil-based paints are more dangerous than water-based latex paints, many latex paints still contain some dangerous solvents. As a result of these new regulations, major paint manufacturers have responded and have re-formulated their paint products to be Zero VOC or Low VOC compliant. According to industry studies, these new Zero VOC paints perform better than the previous formulation latex paint that had high levels of VOC’s. They reportedly last longer, dry more quickly, and are safer to clean up than previously formulated paints. The major paint companies like Benjamin Moore, Sherwin Williams, Behr, and Glidden have made great strides by offering paint products in every color and finish that are completely free of VOC’s. However, the downside is that a more complex energy-intensive manufacturing process is required to produce Zero VOC paint. Furthermore, even Zero VOC paints must always be disposed of properly at a hazardous material collection center in your community to prevent environmental contamination. Davinci's Painting is excited that paint is now safer and becoming more safer for homeowners and painters in to consumers and painters in Northern Virginia. 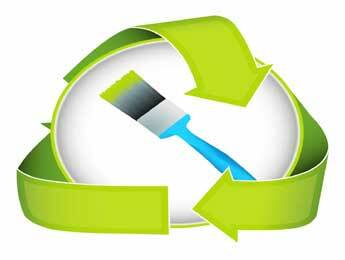 So do your family and the environment a favor, and ask us how we can use Low VOC or Zero VOC paints for your home! Sometimes the powder room in our Home is the area that receives the least attention when it comes to painting. In reality, the bathroom should be given some consideration especially given the fact that most guests will more than likely enter the area. Unlike other rooms of our home, careful planning should be undertaken most notably when it comes to selecting the right color. Determining color options should include variables like, the accessories and components that already exist in the bathroom. 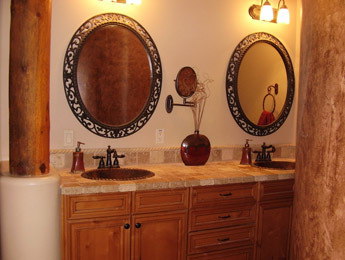 For example, designer sinks, marble handcrafted basins, granite countertops, and Jacuzzi tubs. On the other hand, the bathroom fixtures could be standard faucets and towel racks. The features of the Bathroom should determine the color schema whether it is a dramatic color or just something clean and functional. If you would like to have an atmosphere that is warm and cozy, then most dark-toned color paints would be a favorable option. On the other hand, darker colors will usually make a space seem smaller. Lighter colors tend to provide the impression of a larger space than what it actually is. These days, paint manufacturers prepare palettes that can illustrate how lighter or darker shades can appear together. Davinci’s offers an interactive Color Selector Tool whereby you can test any variation of color with a given space or room background. Nevertheless, It's generally a good idea to buy a sample of the paint color that you like. That way you will be able to check out how the color will look compared with the room’s accessories. Careful thought should also be given when deciding the sheen level of the paint. Since bathrooms are generally damp and humid, this sheen level should be a factor when determining what you will use to paint the walls. The accumulation of moisture on walls can cause mold or even damage to the drywall. Flat Sheen Paint is most appropriate for areas that are low-traffic, or areas where the walls are rarely touched. Flat paint absorbs moisture, which would generally not be a good idea for bathrooms. On the other hand, eggshell or semi-gloss finish type paints do a good job at repelling moisture, and this is the sheen level that we usually recommend for bathrooms and powder rooms. To plan a room with a light color together with a dark color, one unique concept would be to install chair rail molding. Albeit, for a small space such as a powder room, it is important to contemplate whether there is enough wall space to justify the installation of chair rail molding. Basically, the molding can allow a horizontal separation for the wall. The top of the chair rail can be one color, and the color below can be a different color. We offer a vast range of carpentry services including the installation of specialized trim. In the past, most of our Customers have chosen to have the light color applied above the chair rail because it brightens the room. The darker shade below the chair rail will normally cause those components, such as, the toilet and tub, to stand out more aesthetically. Sometimes people would consider this option if they strive to have those fixtures in the bathroom the focal point of the room. On the contrary, a darker color above the chair rail will give rise to a smaller feel in the room. This could be a good idea if your purpose would be to make those low-level accessories less conspicuous. Another great idea to enrich the color combination for the bathroom walls would be to enhance the walls with a stencil design or unique faux finish. Not only do faux finishes provide an opportunity to add your own personal touch to a room, but they can also contribute to the overall style and presentation of the area. One such faux enhancement for the powder room could to simulate other surface finishes, such as stone or brick. If you are considering complementing the look to your bathroom even further, consider using a faux marble painting technique on one or more of the walls. Furthermore, if your bathroom has some minor wall imperfections, faux finishing is a great way to conceal those imperfections.